I don’t about your children but mine seem to be early risers. Too early. I’ve been trying to say to them that they should stay in their beds until 7am. That’s a perfectly acceptable time isn’t it? I wish I could make it a little longer at the weekend’s but it’s not washing yet. Just wait until they are teenagers and I’ll not be able to get them up before lunch time. One of the things I am trying is a very cool alarm clock from Funkywatch. It’s a Tyrell Katz Kids space alarm clock and looks very funky in it’s silver casing and gorgeous illustrated face. It even has one of those twin bells, very retro style. I was a bit worried about giving the boys an alarm clock as I remember having one and was driven nuts with the constant ticking nose it made. However, I needn’t have worried this one is totally silent. It’s great. It even has a back light so if they wake up in the middle of the night they can see what time it is and go back to sleep. I have to say so far so good, with the exception of a few mornings when the boys have been woken up with bad coughing, they have been in their beds until 7. Exactly 7, but 7 none the less. It is working well and I will keep at it and see how it goes. I’d recommend this if your child is a little older and starting to tell the time. My oldest Lucas is 5 almost 6 and he loves this. 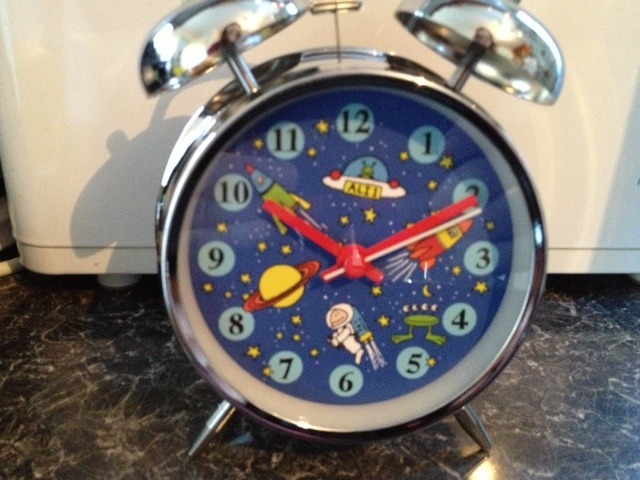 Funkywatch has so many items from jewellery, watches, bags to money boxes and umbrellas. They are really reasonably priced and look fab. So many gifts for a wide range of people. They even have very cool time teaching watches. I plan to get the boys these for their Christmas. They even have next day delivery available.